When I'm cooking an Indian dinner I'm always looking for something interesting to fix as a dessert. Over the years I've served many things, Orange flower ice cream, rosewater ice cream with pistachios, kheer (rice pudding) semolina pudding, burfi, fresh fruit, baked yogurt, roast bananas, I've even rolled my own Paan a time or two. You name it, I've tried it. It's always a delicate balance between sweet, and "oh my god..I can't possibly eat anymore...what? Chocolate???!!" Ok, so what does all this have to do with Chuckles with multicolored jelly candy that my husband is hooked on? Well, actually quite a lot. Here in Sonoma we have a very charming old fashioned style candy store called Tiddle-E-Winks. It's a really cute place and if you ever get to Sonoma definitely worth a visit. One of the things they do at Tiddle-E-Winks is have little cards for kids where their moms pay say 5 bucks and then they get a little stamp on their card when they come in for their candy..sort of a candy account if you will. The cards are kept in a little tin recipe box on the counter and my husband is the only card holder over 12. You see, he loves Chuckles. 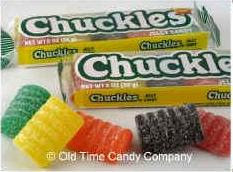 For anyone who's not familiar with them, Chuckles are a brightly colored jelly candy that my husbands' Uncle Bob hooked him on at the age of 6. These are Chuckles. There's a whole ritual, order, whatever you call it, to eating them. Take it from me, it's a guy thing. They start with the green Chuckle which is the least popular Chuckle since it is the color of vegetables, and salad all non guy things. They work their way up the package to the crowning glory..The Red Chuckle. 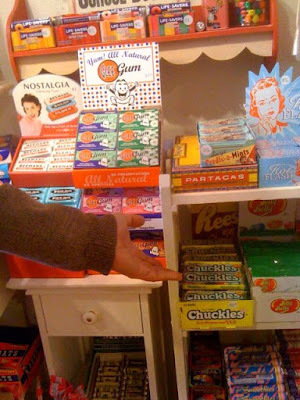 One day I caught my husband very upset at the candy store buying a second package of Chuckles. I asked what was the matter and he said that his friend Andy had asked for one and had TAKEN THE RED CHUCKLE!!! This is NOT done. I said "so, eat the rest". He said "no, that's not the right order I have to start over." He bought another pack of Chuckles and would never go near Andy while he was eating them. The other day while thinking of Chuckles, he was reminiscing over some fancy French jelly candies he'd once had . Sort of the uber Chuckle. A Chuckle with an Ivy League education if you will. He was wishing I could make such a candy. Well, I thought why not. Surely it couldn't be that hard. This thing he was looking for is a medieval French confection known as Les Pates Des Fruits. A Fruit Pate, usually made of 50% pureed fruit and 50% sugar and insanely delicious. So, I set off to investigate and make some. After a great deal of research, going over many recipes I came up with a basic plan for making my upscale Chuckles. They didn't exactly come out as Alan was dreaming, but he loved them, and so do I. They were refreshing, easy to make, very low in sugar and I thought ideal for a treat after an Indian meal. A very satisfying dessert, so that's why I've included them here. 2.) 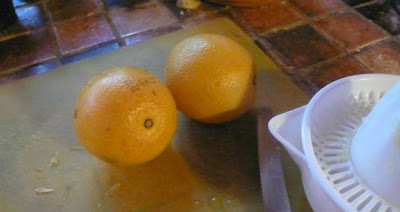 cut them in halves and juice them until you have 1 cup of fresh orange juice. Save the orange shells. 3.) take your orange shells and remove the pulp without poking any holes in the skin. This is what is going to hold our dessert. 4.) mix 1 cup of orange juice with 1/8 of a cup of sugar. Bring it to a boil. 5.) in a separate cup, sprinkle 1 envelope of plain gelatin over 1/4 cup of water. 6.) 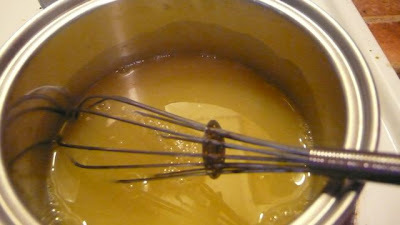 When the juice boils, take it from the flame and stir your water/gelatin mixture into it. Blend it in well. 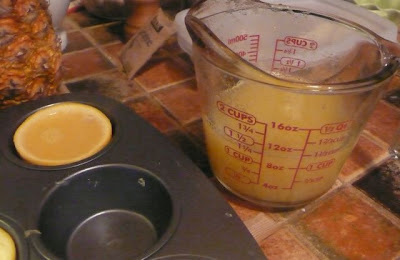 Now, set your orange peel halves in a muffin cup. This will stabilize them while they're chilling. 7.) pour the orange juice mixture into the cleaned out orange skins. Fill them to the brim. 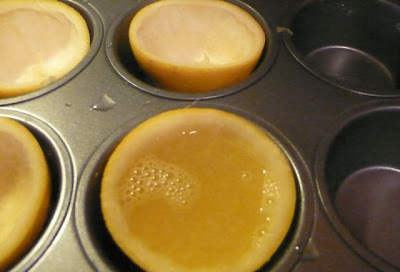 Then take the muffin tin and slide it into the fridge to chill for about 2 to 3 hours. 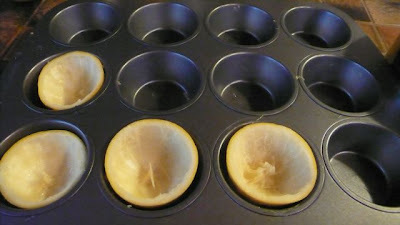 When you're ready to enjoy your orange slices, take them out of the muffin tin and slice them as you would a regular orange. 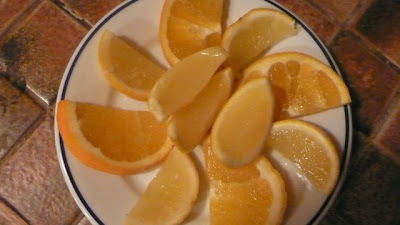 For an extra kick you might try alternating them on the plate with "real" orange slices. This is a tasty light dessert, refreshing served with coffee or tea. Cookies can be added, or not. I've seen this recipe done with Blood Oranges. 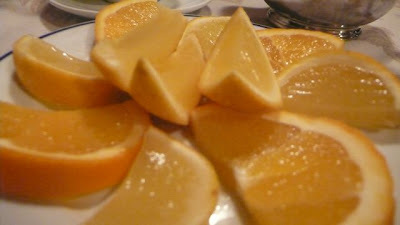 My French neighbor said that over there they make this dessert with Meyer lemons. It's something that begs to be experimented with. One thing my husband likes to do is dip these in granulated sugar. Personally, I think that's overkill and these little fruit gels are not of the gummy, manufactured consistency that would hold up well with lots of sugar applied. So, while these aren't exactly Chuckles, they are a great finish for a spicy meal and really hit the spot around our house. Ok! So I had to add a little addendum. we went shopping this afternoon to pick up a new inker for the printer. We went over to Napa and of course had to pass Tiddle E Winks on the way. Here's my husbands' arm posing next to his favorite treat. I love your idea of using the orange peels as the candy molds. Genius! Guys are so weird. Those look incredibly good. Right up my alley. yeah, I love the way they work too, and that's the way everyone seems to make them. also, spilling hot boiling orange juice down my arm isn't fun.I'm thinking of trying this with apples or maybe quinces, something else where the fruit peel, skin whatever will hold up. @janis, yes he's totally OCD about some really weird "food" items. haha, that's a great story. reminds me of eating slices of cheese from a wheel with others and the one person who always takes the tip of the cheese slice, which is a no-no! this is a fantastic idea for a dessert, and such a wonderful presentation! The Über Chuckle! Haha, I love it! This reminds me of another post I saw for a Japanese confection that is made in quite a similar way. That version, however, was impossible to make in the home kitchen and I love your accessible, whimsical version much more. Thank you, and your story of your husband's regret over the coveted Red Chuckle reminds me very much of my own reaction to "red candy" on the whole. Omg, this is genius! :D Thanks for sharing :) I'm sure to try that soon! These are really pretty and so creative. I was actually laughing out loud at the story- really funny :) Nobody can ever be too old for sweeties... Unless you don't have any teeth :p Heh. These look really yummy and you're right- the perfect way to end a spicy meal! I save the green chuckle for last because it's my favorite. Unfortunately, Chuckles are hard to find in Vermont. There is lots of high quality, fair trade chocolate so I just have to make do.